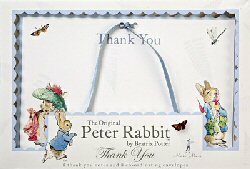 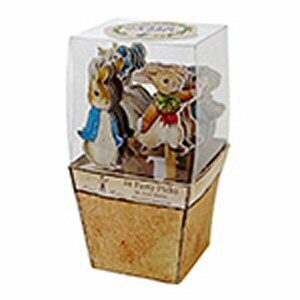 A boxed thank you set with the original Peter Rabbit theme including the timeless illustrations of Beatrix Potter. 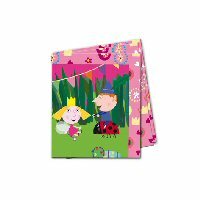 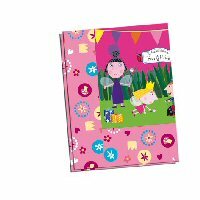 With Peter and friends and complemented with subtle patterned backgrounds and matching patterned envelopes. 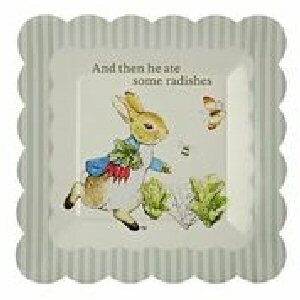 And then he ate some radishes The much-loved words of Beatrix Potter feature on these Peter Rabbit party plates. 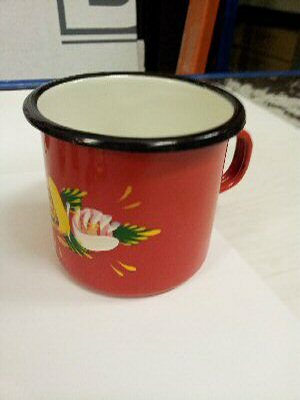 Finished with a blue stripe pattern and scollop edge. 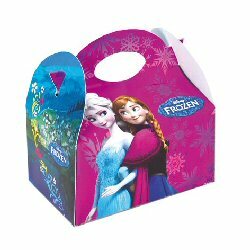 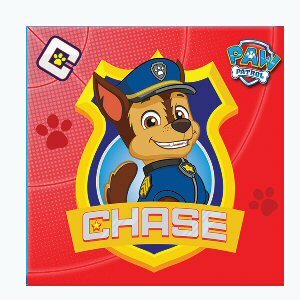 Pack contains 12 paper plates. 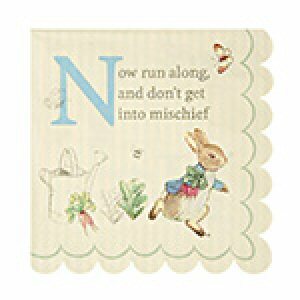 Now run along and don't get into mischief The classic words of Beatrix Potter are quoted on these charming party plates featuring naughty Peter Rabbit. 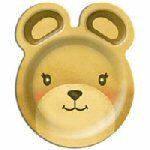 The plates are finished with a stylish scollop edge. 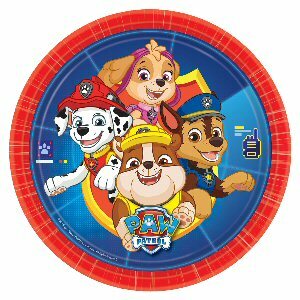 Plate size: 10 x 10 inches. 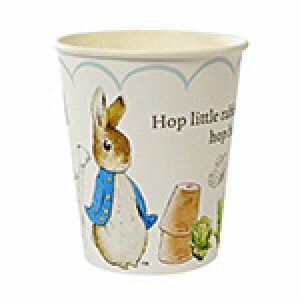 These Peter Rabbit party cups come decorated with the classic illustrations of Beatrix Potter, together with the never to be forgotten line: Hop little rabbit, hop hop hop. 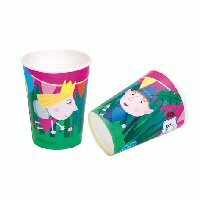 The cups are finished with scollop beading. 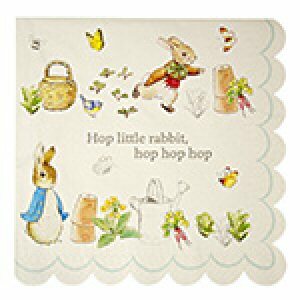 Simply delicious party napkins featuring the ever charming Peter Rabbit and the classic words of Beatrix Potter: Hop little rabbit, hop hop hop. 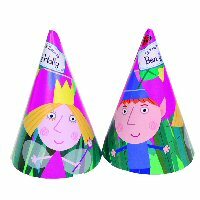 The napkins are decorated with Potter's illustrations and come with a scollop edge design. 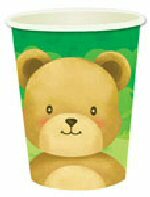 Napkin size: (folded) 7 x 7 inches. 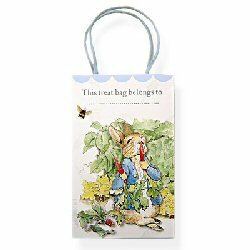 Featuring the ever mischievous Peter Rabbit, this charming party napkin uses Beatrix Potter's classic words and is decorated with a pastel stripe and her immortal illustrations. 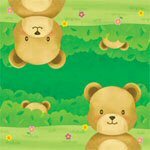 Napkin size: (folded) 5 x 5 inches. 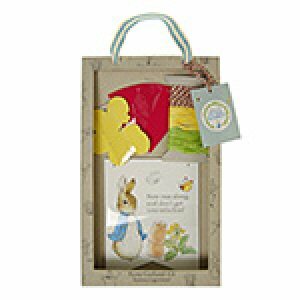 Create the perfect Easter garland with Peter Rabbit! 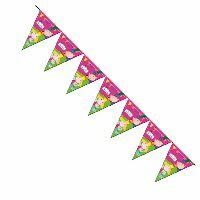 This garland kit comes with everything you need to decorate a party with Beatrix Potter's timeless illustrations, and you can add a splash of spring color by adding 3d flowers and radishes complete with string embellishments. 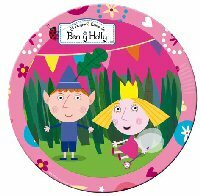 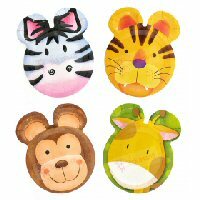 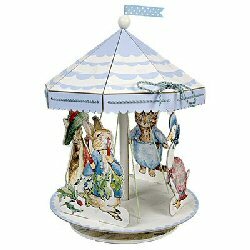 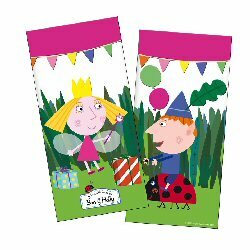 The pennants each have a separate design with characters from the Peter Rabbit stories.